WASHINGTON (CNS) — The University of Alabama’s national championship-winning football coach Nick Saban and his wife, Terry, have teamed up to be advocates and donors to support two major construction projects at the Catholic church on campus where they worship. At St. Francis of Assisi Church in Tuscaloosa, Alabama, construction is underway for a $1.9 million, 4,600-square-foot Saban Catholic Student Center. It is scheduled for completion this August so students who arrive this fall will be able to use it. That endeavor follows closely behind the building of a $6.8 million, 750-seat church that includes a 50-seat chapel for daily Mass, with an adjacent parking lot needed for a growing congregation. Saban, whom Fortune magazine recently named the world’s 11th best leader for 2016, and his wife have been consistent Sunday Massgoers at the campus church since the coach’s 2007 arrival at Alabama, joining roughly 800 families and 800 to 900 students who regularly attend Mass there, said Father Gerald Holloway, the football team’s chaplain and former pastor at the church. 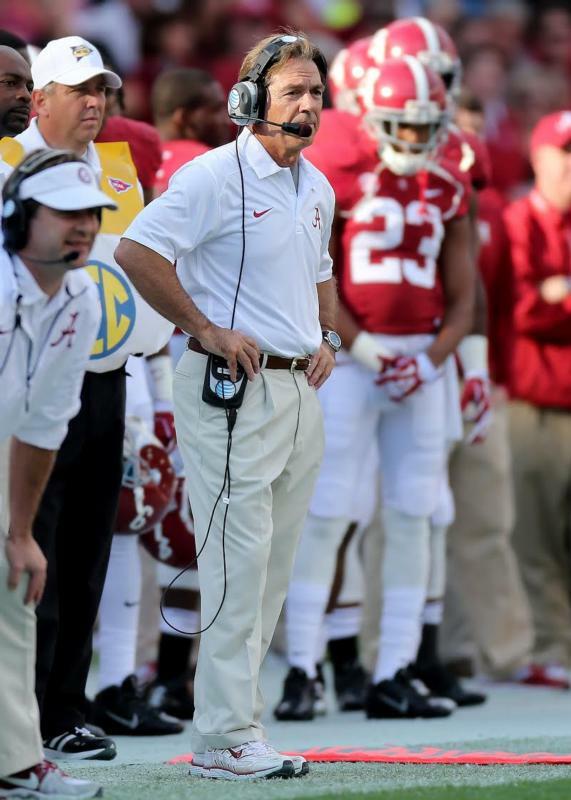 In fact, the coach attends the 9 a.m. Sunday Mass with such regularity when he is in town that Alabama alumni began calling that liturgy “Nick at Nine,” Father Holloway added. The Saban Catholic Student Center will have three main spaces, including a study room that can be used for instructional purposes, for large group meetings and for hosting guest speakers, said Father Tom Ackerman, who last July succeeded Father Holloway as St. Francis of Assisi’s pastor. Site work for the project began earlier this year, the priest said. Roughly $1.4 million of the approximately $1.9 million price of the student center’s construction has been raised and another $129,540 has been pledged, Father Ackerman said. The new church was built while Father Holloway was pastor and $1.46 million of the $6.8 million total remains outstanding. Saban and his wife have spoken at the parish to assist in fundraising efforts. “When they are in town, they’re here,” Father Ackerman said, adding that the Sabans are joined at church by the coach’s mother when she visits them. Somehow, Saban even managed to arrive in time for the 9 a.m. Sunday Mass Dec. 13, even though the previous evening he was in New York City for the Heisman Trophy award presentation to his team’s star running back, Derrick Henry. Both Saban and his wife spoke to kick off the fundraising campaign for the church project, the priest said. They also made a “substantial contribution” of seed money for the Saban Student Center that parish leaders chose to name in honor of the coach and his family, with their permission. Terry Saban has addressed the congregation at Mass on the Sundays after football games in the fall to seek additional donations for the student center. She has proven to be “quite an effective speaker,” Father Ackerman said. He recalled that in remarks at the Feb. 1 groundbreaking for the student center, Coach Saban said he asks his players if they pray to be blessed or pray to be a blessing to other people. “As Christians, we should not be looking after ourselves but looking to help others,” Father Ackerman said. Father Holloway, now an associate pastor of Prince of Peace Parish in Hoover, Alabama, has been the football team’s chaplain for the past 13 years. A chaplain’s contributions to a football team can be meaningful, he said, even though critics contend public institutions should not provide such a spiritual presence. Father Holloway says weekly Mass and leads pre-game and post-game prayers for Saban and his team during football season. Mass attendance is voluntary and anyone involved with the team who wants to come is welcomed, Father Holloway said. The Mass, which attracts “mostly Catholic players,” is celebrated Friday night when a Saturday game starts at 11 a.m. or is celebrated the morning of the gridiron contest when it is scheduled for 2 p.m. or later, he added. The chaplain said he has received and carried out requests for prayers and one-on-one counseling with some of the student-athletes. He said some have spent time talking to him as they try to adjust to the demands of school and playing on the football team. With Father Holloway’s transfer before last season to Prince of Peace Parish more than an hour drive away, those conversations are less likely to occur regularly. However, Father John Fallon, the pastor there, is an avid “Bama fan” who Father Holloway said made it possible for him to continue his role as Saban’s team chaplain. The Crimson Tide won its fourth national title Jan. 11 in just nine seasons with Saban as its coach and with Father Holloway as chaplain. The priest said he hoped he can remain the team’s chaplain, despite the distance of his latest parish assignment. “It has been a tremendous blessing for me to be a part of the football team,” said Father Holloway, who added he tries to offer motivational words for Coach Saban and his team during his pre-game Mass homilies and prayers. The priest said he also attempts to help the student-athletes develop into productive citizens.